We are all about tacos (especially on Tuesdays, haha) in our house. Of course, having the same old tacos every week can get kind of boring no matter how good they are. So, when we get tired of our regular carnitas tacos, turkey and black bean tacos or even, chicken bacon mango tacos, I make shrimp scampi tacos to change things up a bit. 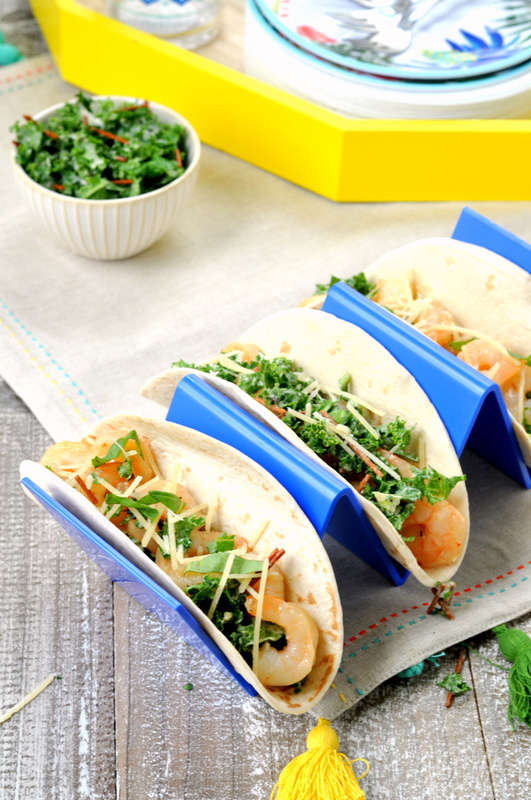 One of the bonuses to these shrimp scampi tacos is how quickly they cook. 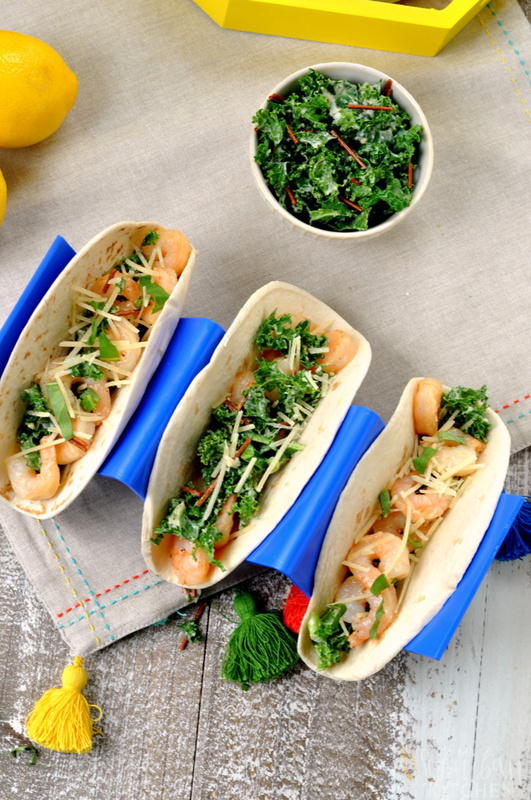 Toss together the kale slaw that goes on top and heat your tortillas while the shrimp cooks and you have a delicious meal ready in under 15 minutes! 1. Heat butter in skillet over medium heat. Once melted, add garlic and cook for 1 minute, stirring frequently. 2. Season shrimp with salt and pepper. Add to skillet and cook 2-3 minutes on each side or until fully cooked. Remove from heat and stir in crushed red pepper and lemon juice. 3. In a small bowl, combine kale and dressing. Toss to combine. 4. 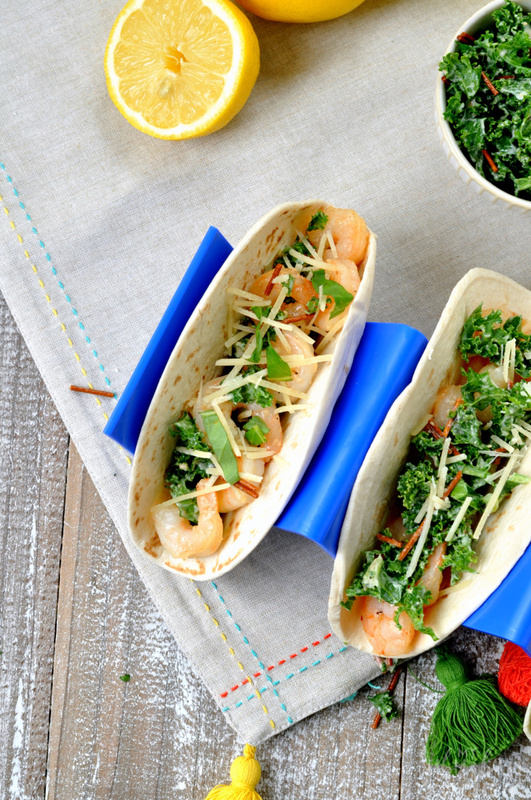 Spoon shrimp into tortillas. Top with kale salad and shredded Parmesan. If anyone in your family is like mine, they might turn their noses up at the kale when it first hits the table but, once they taste it in the tacos, you won’t hear a single complaint. You could easily use romaine lettuce though if your family isn’t a fan of kale. What are some of your favorite non-traditional taco recipes? Are you always on the hunt for quick and easy recipes that you know your family will love? Heat butter in skillet over medium heat. Once melted, add garlic and cook for 1 minute, stirring frequently. Season shrimp with salt and pepper. Add to skillet and cook 2-3 minutes on each side or until fully cooked. Remove from heat and stir in crushed red pepper and lemon juice. In a small bowl, combine kale and dressing. Toss to combine. 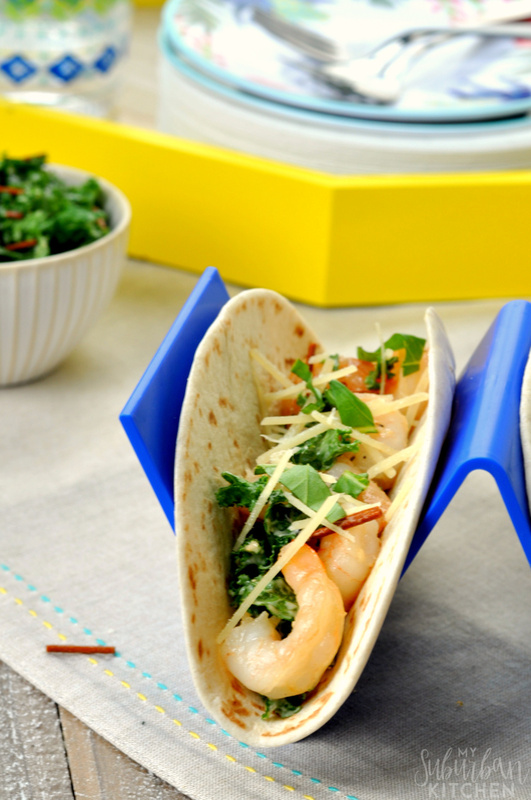 Spoon shrimp into tortillas. Top with kale salad and shredded Parmesan.